A suture is a piece of thread-like material used to stitch or approximate tissues, and hold the wound together until healing takes place. any strand of material used to ligate bleeders or used to approximate tissue. any materials used to sew, sick or hold tissue together until healing process occurs. Ligature or Tie – refers to a suture material that is tied around a blood vessel to occlude the lumen. 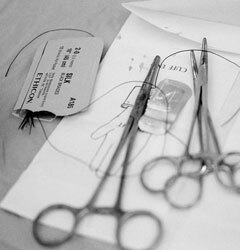 Free tie – is a stand of material that is handed or given the surgeon or assistant to ligate a vessel. This stand is not threaded on a needle. Stick tie or suture ligature – the suture material is threaded either on a needle holder or on a right angle clamp before occluding a deep or large vessel. Atraumatic Suture – a suture material prepared or manufactured with a needle attached to it. It is referred to as an eyeless needle or atraloc-swage on needle. Strand – suture material prepared or manufactured without a needle attached to it. Continuous Suture – a suturing technique wherein a surgeon start suturing at one point and ends at the other point without cutting the suture material. This may be referred to as a running stitch and also used to close the peritoneum and vessels because it provide a leakproof suture line. Interrupted Suture – the suture is taken, tied and out separately. This technique is time consuming. Subcuticular Suture – a continuous suture is placed beneath epithelial layer of skin in short lateral stitches. It leaves a minimal scar formation. Buried Suture – a suture placed under the skin, buried either continuous or interrupted suture. Traction Suture – is used to hold tissue out of the way during the operation. 1. Absorbable Suture. An absorbable suture is made from material that can be absorbed (digested) by body cells and fluids. Rate of absorption depends on various factors, including type of body tissue, nutritional status of the patient, and the presence of infection. Absorbable suture is available prepackaged and presterilized in various sizes graded by diameter and length. Sizes range from number 12-0, which is the finest, to number 5, which is the heaviest. The length ranges from 12 to 60 inches. in the tissue. This suture is absorbed more rapidly than treated suture. becomes encapsulated (enclosed in a capsule) with tissue and remains in the body until it is removed or cast off. Silk, nylon, cotton, linen, polypropylene, and corrosion-resisting steel wire are examples of nonabsorbable sutures. Sutures used for skin closure are usually removed before healing is complete. It must be uniform in tensile strength by size and material. It must be hypoallergenic and less tissue reactive. It must be safe on each type of tissue. It must be secure and tight when knotted. It must be appose and maintain the tied tissues together until it fully heal. Operating Room Technique Instructional Manual – 2nd Ed.